The Chicory, a much-loved event venue in the warehouse district of New Orleans, was the setting for this wedding ceremony and reception, which was coordinated by Emily Sullivan of Get Polished Events. This beautiful cake on display at a wedding reception was created by Royal Cakery. There are many great bakeries in the New Orleans area, but Royal Cakery is one of the most highly regarded. Get Polished Events coordinated the wedding, and Firefly Ambiance and the flower ninjas at NOLA Flora were responsible for the beautiful decorations throughout the venue. 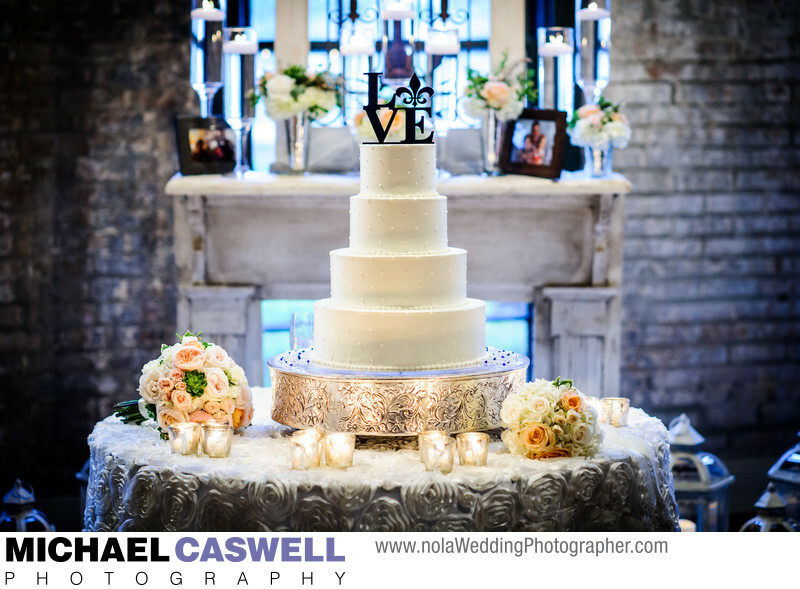 Visible behind the cake is a beautiful arrangement of flowers and floating candles set up on a freestanding antique mantle, which was positioned directly behind where the bride and groom stood during their ceremony, and provided a gorgeous backdrop for their exchange of vows. The Chicory is a wonderful wedding venue located on South Peters Street in the Warehouse District. A rooftop terrace is available for outdoor ceremonies, or vows can be exchanged inside with several different rooms of varying sizes and character being options as well. And of course you can just have your reception at The Chicory, with your ceremony taking place at one of the many beautiful churches in New Orleans, such as nearby St. Patrick's or Immaculate Conception.